A quaint, chinzy living room. A very old lady, Mary, enters, followed by another slightly younger lady, Eileen. They shuffle towards the table and armchairs. On the table are various ornaments, including a half-knitted sweater. EILEEN: Absolute murder out there. MARY: I didn’t realise you were coming over, I’d’ve made a cake. EILEEN: Oh no Mary I’m just popping round. MARY: Put a sponge in if I’d known. EILEEN: Have you been knitting? MARY: I’ve been knitting yes. EILEEN: Who’ve you been knitting for? MARY: No one in particular. EILEEN: I shouldn’t think you’ve anyone to knit for nowadays. MARY: I just like to knit. EILEEN: I suppose if it keeps you busy. MARY: Kettle’s just boiled. Would you like a cup of tea? EILEEN: That’d be lovely, thank you. MARY: I’ll do you a tea. Eileen sits down in an armchair and makes herself comfortable. Mary re-enters with a cup of tea and puts it on the table. Every time Mary exits, a little jingle plays until she has put the cup down on the table. MARY: There you are love. EILEEN: Very well, yes thank you. EILEEN: Rosemary’s come through lovely. EILEEN: Come through lovely, yeah. MARY: Only I thought because of the frost. EILEEN: Well it’s hardy isn’t it. Had Derek round yesterday, taking pictures of my pulse patch for his magazine. MARY: Maggots did you say? MARY: The maggots have been at your pulses have they? EILEEN: No, magazine. I said magazine. MARY: Oh, magazine. My ears nowadays, honestly. MARY: What’s that about a magazine then? MARY: Derek’s got a magazine? I thought he couldn’t read. EILEEN: He takes photographs for it. It’s a gardening magazine. He does the photographs for it. MARY: You should have him round your garden. He could take some photos. EILEEN: Yes that’s what he was doing, see. MARY: Oh I see. No trouble from maggots then? EILEEN: No, not this time of year. MARY: Because if you’re having photos taken you wouldn’t want any trouble with maggots, would you? EILEEN: No I wouldn’t, no. MARY: Well it’s lovely to see you Eileen. It’s been ever so quiet. Not many people out in this weather. EILEEN: Best stay indoors when it’s like this. I hope you’re not going outside, not with your knee. MARY: I’d never get back up if I fell. EILEEN: Not with your knee. MARY: I’d be out there all night if I went over. EILEEN: Well I wouldn’t have made the journey, but I’ve some news. EILEEN: Before I forget let me come out with it. I’ve a bit of gossip you see. MARY: What’s that love, you’ve been to Glossop? EILEEN: No, I said I’ve a bit of gossip for you. EILEEN: I know you like a bit of gossip. MARY: You’d like some bitter cough syrup? EILEEN: No, I said you’d like a bit of gossip. MARY: Would I? Oh yes. EILEEN: It’s about Joan. You know she’s getting married at Christmas, well they’ve chosen a destination for their honeymoon. You’ll never guess where they’re going. MARY: Hold that thought Eileen, can I get you a cup of tea? EILEEN: Oh, I’d love a cup of tea, thank you Mary. MARY: I just realised you’ve been sat there and I haven’t offered you a cup of tea. EILEEN: I’d love a cup of tea Mary, thank you. Mary exits. The music plays. Eileen picks up a dead plant. She sniffs it, then drops it on the floor. She takes out a live plant in a plant pot from her bag and puts it on the table. Mary enters with a cup of tea. She places it on the table with the other one. The music stops. EILEEN: Thank you love. You always did make a good cup of tea. MARY: I like to host. Keeps me active. EILEEN: Not so much since your Pat left though. EILEEN: Not so many parties since Eric died and your Pat left for New Zealand. EILEEN: I’m saying you don’t host as much now. MARY: Not with my knee. EILEEN: No, no not with your knee. EILEEN: Are you still drawing? The birds? EILEEN: Are you still drawing birds? MARY: I don’t have the fingers for it any more. EILEEN: Shame that. They gave you a nice little income I imagine. MARY: I liked the freedom. EILEEN: That reminds me, I’ve got some news about the wedding. EILEEN: They’ve chosen a date. MARY: They’ve chosen a date? MARY: What date have they chosen? MARY: A Christmas wedding, how lovely. EILEEN: They were hoping for Easter but the church was booked up. Paul wanted it around a religious festival you see. MARY: Oh of course, I forget he’s a Catholic. Have they thought about a honeymoon yet? EILEEN: Oh, I don’t know. I’ll have to ask her. I can’t think of any catholic honeymoon destinations. MARY: I went to Glossop. EILEEN: Yes but they like to travel nowadays, don’t they? Look at your Patricia. Went halfway round the world and never came back. Mind you after what happened I should think that’s for the best. MARY: Would you like a cup of tea Eileen? EILEEN: You read my mind Mary. Eileen looks through her bag and takes out a picture in a frame. She takes a picture off the table – a drawing of a bird in flight – and drops it on the floor, replacing it with her family photo. Mary re-enters with two cups of tea. She places one in front of Eileen. The music stops. EILEEN: Did you say you’d put a cake in? EILEEN: A sponge was it? MARY: Should I put one in? MARY: I could do a sponge. Should I put one in? EILEEN: Only I did mention I was coming today. I thought we could have a nice piece of cake. EILEEN: Yes I did ring ahead. Do you remember? Me ringing ahead? EILEEN: I called two days ago asked if it was okay to pop round. In case you were busy, already had visitors. I knew you wouldn’t but thought it polite to ask all the same. Do you remember? MARY: I’ll put a sponge on. EILEEN: Oh no Mary I’m just popping round. Don’t trouble yourself. I just came because I’ve a bit of news about our Joan. MARY: Oh I’ve not seen your Joan in weeks, how is she? MARY: She’s getting married? To that lovely catholic fella? MARY: Oh bless her. Little Joan all grown up and getting married. I remember when she was running round in skirts and scraping her knees. Do pass on my congratulations. MARY: You’ll have to take her one of my bird pictures. As a present. MARY: Don’t have many left now but it’s a special occasion. MARY: I enjoyed the freedom. I’ve not the fingers for it now. EILEEN: They’re hoping for an Easter wedding, so it coincides with the death and resurrection of the Lord Jesus Christ. MARY: And it’s in Glossop, you say? EILEEN: Glossop? I shouldn’t’ve thought so. MARY: Have they got a cake? MARY: I could do a sponge. EILEEN: There’s an idea. I could give you some strawberries from the garden. MARY: What about the maggots? MARY: I thought Derek said you had a problem with the maggots? In the garden. EILEEN: Did he? No love I think you’re mistaken. It’s all come through lovely. MARY: Here’s your tea by the way. She hands Eileen the other cup of tea. MARY: I’d do one with plums from the tree but whenever I go to collect them the branches are always empty. EILEEN: I’ll ask if you can come along. EILEEN: To the wedding. It’ll be nice that won’t it? EILEEN: Because your Pat never did get married did she? In the end. EILEEN: Mary, I’m saying you never had a wedding to go to for your Pat, did you? She was never married. EILEEN: Your daughter never married. MARY: Can I get you a cup of tea? EILEEN: Yes please, I’m gasping. Eileen goes through her handbag and takes out a handful of plums, which she tips into an empty fruit bowl on the table. Marry re-enters with a teapot and a cup of tea. 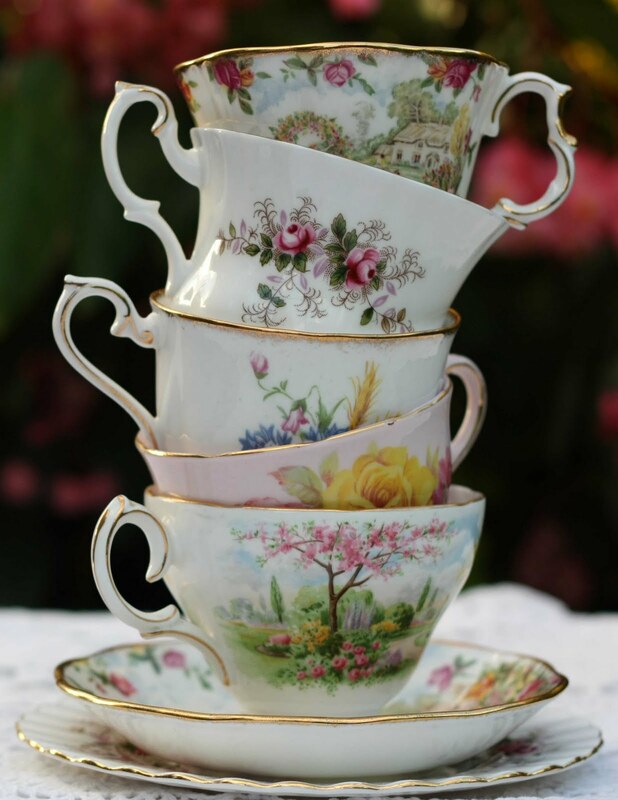 She puts them on the table with the collection of teacups. The music stops. MARY: I brought the pot in. Save me going back and forth for refills. EILEEN: You don’t want to be doing that with your knee Mary. MARY: Well I thought, see. How’s that chest of yours? EILEEN: What chest of mine? MARY: You had a bad cough didn’t you? MARY: You were asking after some bitter cough syrup. EILEEN: If I were ever ill it’s all cleared now, thankfully. MARY: I’ve some Echinacea. For your cough. EILEEN: Thank you. I’m fine though. EILEEN: Yes, my granddaughter Joan uses it. Did I tell you she’s met a fella? EILEEN: Yes my granddaughter Joan, she’s met someone. EILEEN: He’s lovely. A catholic man. MARY: So he’s got morals then. EILEEN: He’s a bicycle courier. MARY: He’s got a bicycle career? EILEEN: I do hope she settles down. She’s had such a hard life. MARY: She’s met a catholic now. EILEEN: He’ll see she’s well looked after. MARY: He sells bicycles does he? EILEEN: He may well do. MARY: For a magazine did you say? MARY: He sells photographs of bikes to a magazine? MARY: I wonder if there’s money in that. EILEEN: Well everyone needs a bicycle. EILEEN: Not with your knee love. EILEEN: Can’t even make it up the stairs nowadays can you? Let alone jump on a bicycle. Remember when we used to cycle down to coffee mornings? EILEEN: Every Sunday we did that. You me and your Eric. EILEEN: And now you’ve a mattress in the dining room to save you using the stairs. Funny isn’t it, really? How things change. EILEEN: They still ask after you at the coffee mornings. Sometimes. MARY: I’ve left the kettle boiling, would you like a quick cup of tea? EILEEN: A quick one then, yes please. Eileen goes over to a pair of slippers and puts them on after taking her shoes off. Mary re-enters. The music stops. MARY: I’m sorry Eileen, I can’t find the teapot. EILEEN: Oh not to worry love, I’m just popping round anyway. MARY: I could’ve put a sponge on if I’d known you were coming. EILEEN: I’ll bring our Joan. EILEEN: She’s all grown up now. MARY: Really? Well I never. It goes fast doesn’t it. EILEEN: She’s a lovely young lady now. When was the last time you saw her? MARY: I think she’d scraped her knee. MARY: You gave her Echinacea. For the wound. EILEEN: That must’ve been a long time ago, I can’t seem to remember that. MARY: It was many many years ago. EILEEN: Well she’s much older now. She’s blossomed. MARY: That’s good to hear. Bless her. EILEEN: I do hope she finds a good man. She’s been through so much hardship and woe. I just want her to find a nice fella and settle down. EILEEN: She bought a bicycle the other day. MARY: They do them in magazines now, don’t they? MARY: Apparently. They take pictures of them for the magazines. Then people buy them. EILEEN: I’ve never heard of that before. EILEEN: You’ll have to meet her again. She’d love to see you. MARY: Maybe she can cycle round. EILEEN: Yes, when the ice clears. MARY: Wouldn’t want her cycling around on the ice. EILEEN: It’s murder out there. Coffee morning’s been cancelled on account of the ice. Not that you’d have gone of course. You’d hardly recognise anyone down there anymore. So many new faces. EILEEN: New to you I mean. Unfamiliar. Of course they wouldn’t know who you are. You’d be a stranger now. EILEEN: You’d be lost. Even your old friends wouldn’t recognise you. I suppose that’s just how it goes. MARY: Would you like a cup of tea? EILEEN: No thanks, I’m not a big tea drinker. Could I have a wheatgrass smoothie? MARY: Yes of course. Give me a moment. Eileen takes a flannel blanket from her bag and spreads it over her knees. Mary re-enters with a glass of wheatgrass smoothie. She struggles to find a place on the table for the glass. Eileen waits, watching. The jingle continues playing on a loop. Finally Mary moves some cups around and makes space for the glass of smoothie. MARY: There you go love. EILEEN: I can’t remember the last time we saw each other Mary. When was it now? MARY: Oh dear I can’t remember. It must be some weeks ago now. Before the frost. MARY: Yes it may be some years now, looking back. EILEEN: I’ve so much to tell you Mary. I don’t quite know where to start. MARY: Perhaps I could put a sponge in. EILEEN: I have a granddaughter you know. MARY: A granddaughter. Well I never. And all that time you thought she was barren. EILEEN: Well, she’s very hardy. MARY: Good for you. A granddaughter. EILEEN: People say she has my features. I think you’d recognise her without even meeting her. MARY: Fancy that. What a queer idea. EILEEN: I hope you don’t think I’ve come to gloat. It must be sad for you. EILEEN: Having no-one left, the way it is with you now. EILEEN: You’ve no-one left, do you? It must be ever so lonely. MARY: I like to host. EILEEN: Not so much now though. Not since your Pat left. EILEEN: I don’t mean to be impolite, but this tea is cold and green. EILEEN: And it’s a bit thick. I think you may have let it stew for too long. MARY: Goodness, I am sorry. Let me get you a new one. MARY: Give me a moment. Eileen takes up the half knitted sweater and starts to knit. Mary re-enters, empty handed. The music stops. MARY: I can’t find my cups. MARY: All my cups have gone. EILEEN: Can I help you? EILEEN: I said can I help you? EILEEN: I’m sorry. Do I know you? I don’t think I know you. EILEEN: I’m sorry love but I don’t usually allow strangers into my home. EILEEN: I’m all alone you see. My husband died a long time ago and I live alone. I’m very vulnerable. EILEEN: On account of my being all alone. It wouldn’t be very prudent to allow strangers into my home. I’m afraid I’ll have to ask you to leave. EILEEN: Yes, you’ll have to go I’m afraid. MARY: I shouldn’t really leave the house. EILEEN: Well goodness knows how you ended up here then. EILEEN: I’d have you to stay only I’m knitting a sweater for my granddaughter. Eileen moves to usher Mary out the door. EILEEN: Do be careful on the way out, with the ice. EILEEN: Yes make sure you wrap up warm. It’s very cold out there. EILEEN: You’ve a bad knee do you? Well make sure you take care with that. Wouldn’t want you going over on the pavement. You’d be there all night. They have reached the door. Eileen is gently pushing Mary out. EILEEN: And watch for the ice. It’s absolute murder. Eileen moves back to the armchair and continues to knit.